my newly painted, op shopped, cutting table as it looked immediately after putting it in the room. now it is covered with boxes and piles but i am making progress in there... along with a long list of new projects as i sort through fabric and patterns. eep. i'm super happy with this table, anyway. after months of searching for a solution that would offer me a cutting space AND storage AND be decently priced, i spied this sturdy, pine table at st vinnies in altona for $30 and decided it would do excellently on two counts. 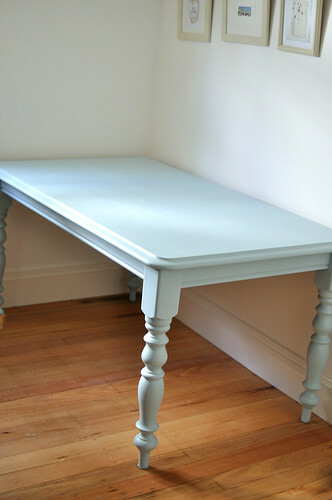 a lick (or three) of leftover house paint that we aren't using anyway (we changed our minds and have gone with a taupey grey) and i'm loving my cutey, blue table. i will find a little bookcase or some baskets or something to offer a bit of storage underneath but at least i have space to spread out patterns and fabric now. or will have. when it's cleared off. someday. 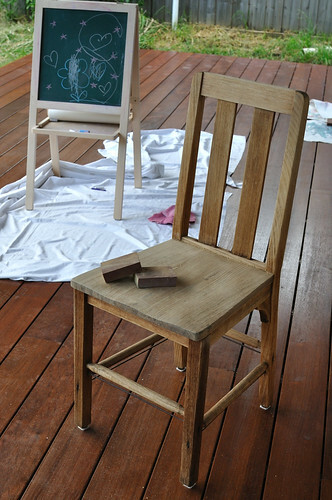 and the other project that i have been working on for the past month or so: sanding and sealing eight of these lovely, sturdy wooden school chairs that have lived in my father-in-law's shed for the past 20 years or so. i've finished three of them and they look great, all satiny and a deeper colour from the sealer that i'm using (don't actually know what it is, shane just gave me a pot and a brush and i went to work), full of character and beautiful flaws. only five more to go! Beautiful chairs and the new deck looks fantastic! Top work Shane. All of your projects have turned out beautifully, and your productivity is astounding and enviable! I find in January it takes all of my energy to just stay ... awake ... [yawns]. Just love both chairs and table! I love your new to you table! Such a pretty color!